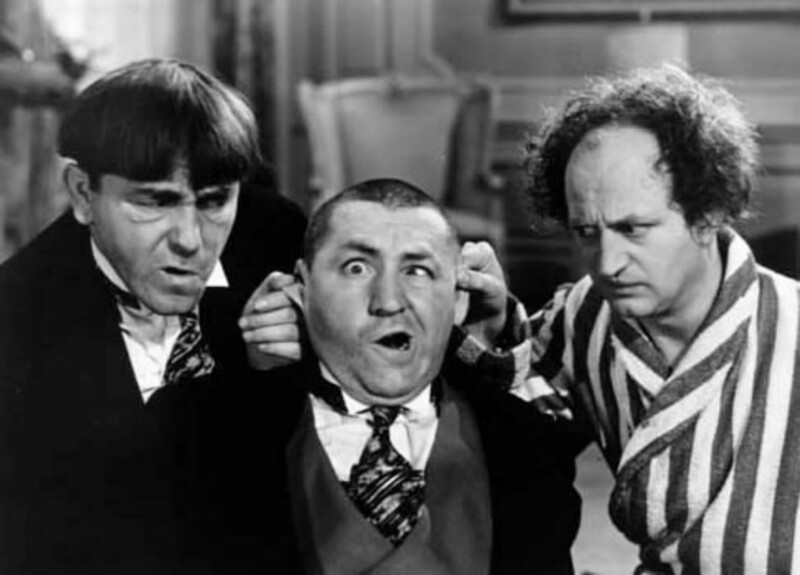 The Farrelly Bros.’ Three Stooges Movie Rumors Continue to Morph: But Do We Even Want or Need This Movie? While you were likely busy this past week calling Rebecca Black’s house and leaving her nasty messages simply because she’s a thirteen year-old girl who wants to be a pop singer, the rumor mill surrounding the Farrelly Brothers’ reboot of the Three Stooges franchise took another turn of the crank. And you’ll be pleased to know that now a Three Stooges movie which already sounded terrible is sounding more terrible. Which means it has to be nearing “terrible enough” for Hollywood to make! Hooray! To catch you up to speed, we should begin at the beginning: you were clamoring for a Three Stooges movie, and the Farrelly Brothers, who — let’s call a spade a spade — are probably the most likely in a universe of current directors to helm something like this, decided in 2009 to deliver that product to you. It wouldn’t be a biographical picture; rather, an updating of the franchise to present day, featuring “three vignettes” of Stooge stories. So they went for the natural choices to play Larry, Moe and Curly: Sean Penn, Benecio del Toro and Jim Carrey, respectively. Yes, seriously. And allegedly, they all said yes. Finally, our nation’s collective dream of seeing Sean Penn hit Benecio del Toro in the face with a pipe wrench would come to fruition. If this didn’t sound like an awful enough idea as it stood, the project soon began to morph uncontrollably as the actors slowly disassociated themselves from the project. Penn and Carey departed from the film, leaving del Toro to look really stupid when fielding questions about the movie on numerous red carpets. Eventually, I assume, del Toro realized he was the only one still attached, and he jetted too. After all, The Wolfman must have looked like a potential Oscar winner movie that would be made. With the three roles re-opened, the Farrelly Brothers reportedly began reaching out to other Hollywood players. Paul Giamatti was briefly mentioned as a replacement for Penn, and we soon saw a new iteration of Stooges rumor: that Larry David, Woody Harrelson and Justin Timberlake were all “fighting” over the role of Larry Fine, with Hank Azaria eyeing the role of Moe Howard. These rumors, like all others surrounding the film, lasted about two days apiece. With the slate clear again, the suits have reportedly gone back to work, yielding a rumor only two weeks ago that Johnny Knoxville would take on the role of Moe. Knoxville then stated to reporters that while he was interested, he had not been extended an offer to play the Stooge leader. Andy Samberg has also been rumored to be on the Farrellys’ short list for Larry in the film’s current state and an Australian comic named Shane Jacobson, who became a hit Down Under by starring in a comedy about plumbing, is perhaps a candidate for Curly. Again, the rumors dissipated, and we were left with a blank slate for the film — until four days ago, when Cher tweeted to her followers a question: Hey ! Anyone got An opinion about me playing “Mother superior”of Orphanage where 3 stooges grow up in new film ” The 3 Stooges?” Then yesterday the Hollywood Reporter ran a story stating that MadTV’s Will Sasso was the new hot choice to play Curly. And that’s where we are. I think it’s safe to say that the only person who’ll definitely be in the Farrelly’s Three Stooges is Richard Jenkins — because he’s in every Farrelly Brothers movie. But the entire process thus far really begs the question: Do we even really need a Three Stooges movie this badly? And is there any actual shot that it could even be any good at all? To be fair, I do generally like the Farrelly Brothers as comic directors, and they do write “stupid” well (I’m not too highbrow to admit that Dumb & Dumber is an fun and funny movie, and nor should you be), but at this point what have we got? What did we ever have? We’ve gone from Sean Penn, Jim Carrey and Benecio del Toro to a supporting actor on $#*! My Dad Says…and Cher. Here’s an idea. How about we all just watch the original Three Stooges and enjoy them? Because not everything has to be remade. And those originals? Pretty goddamn funny, if you ask me. Sometimes the first take was the best one.